Yesterday I posted some data looking at a popular hobby horse within the US skiing community: Andrew Newell’s alleged tendency to ski really fast in the qualification round and then not advance far (or not far enough) in the heats. Last night a friend emailed me to let me know that I kind of screwed up that post and so I went back and edited it to fix the problems. Since I don’t believe in erasing my mistakes from the inter-webs, my edits are sort of interspersed throughout the entire original post. Because I think that makes the post somewhat hard to read and because we[1. By this, of course, we mean the royal we.] here at Statistical Skier believe in drawing as much attention to our mistakes as humanly possible, I decided this error of mine deserved a follow-up post of it’s own. This is the median difference in the qualification rank and the final rank of male sprinters with at least 15 top thirty results from 2006-2007 forward. The error bars can be thought of as estimates of variability (as before they are bootstrapped 90% confidence intervals, if that means anything to you). My mistake was including results from when the heats only used the top 16 skiers. I’m doubly irritated by this mistake since for some reason when that changeover happened refuses to remain lodged in my brain. It’s possible that my friend who alerted me of the problem has answered that very question for me at least 3-4 times since I started this blog. Argh! 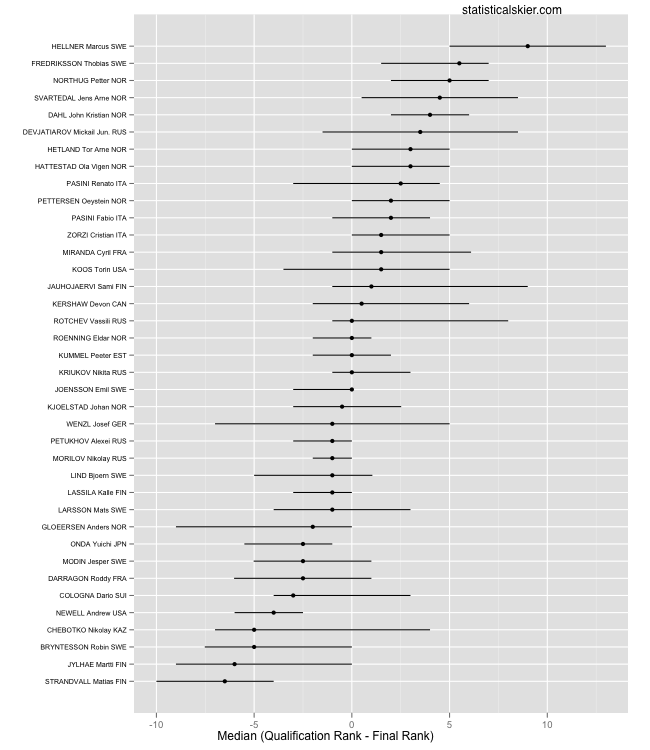 That means that there were many more athletes present in the old graph with very small median differences, since I’d included a lot of instances of people finishing in 17th-30th in races where only the top 16 moved on. You can go back and piece through my edited comments from yesterday, but the basic picture remains the same, I think, at least regarding Newell. His median difference is about the same and compared to the group he still seems to suffer from this occurrence more often than most of his peers (at least, those with at least 15 top thirty finishes). In any case, I screwed up. Sorry! Posted by Joran on Wednesday, December 8, 2010, at 11:00 am. Filed under Uncategorized. Tagged andrew newell, heats, qualification, Sprint. Follow any responses to this post with its comments RSS feed. You can post a comment or trackback from your blog.